Please. Remember the 90s. If you don't who will? Only real '20s kids remember Nickelodeon Gak and the Monica Lewinsky scandal. In the year 1994, Kreiger and Centurion were experimenting on the Talisman and had partnered with Mike Power to access the artifact's energies. Power's contact not only reactivated the relic but had the unintended side effect of pulling the Axalon and Savage from the timestream. 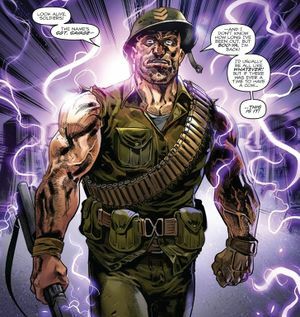 Disoriented, Savage witnessed a battle between Kreiger's forces and Adventure Force that seemingly ended in Power's demise before realizing that he was no longer in 1944. Though nervous for a while, Savage soon realized how awesome the 1990s were, happily adapting to the times, particularly becoming a fan of Bart Simpson. He soon joined Action Man's Team Extreme battling the threats of the new era. Circa 2006, Savage received a distress call from Mount St. Helens and flew off to respond only to find Bugly engaged in combat with the new G.I. Joe unit before Centurion knocked the Decepticon out. Savage landed and joined up with Colton, Kreiger, and Joshua Red who had brought the Talisman to the mountain, where a former Decepticon base rested, to try and develop anti-Cybertronian weaponry. As Colton and Kreiger touted the benefits of the Talisman, Centurion dragged Bugly into the room. By this point however, the Decepticon had rebooted and begged to be freed as he was chained to the Talisman. Sgt. Savage originates from the short-lived G.I. Joe spinoff Sgt. Savage and his Screaming Eagles, wherein the good sergeant was cryogenically frozen during World War II before awakening in the 90s. 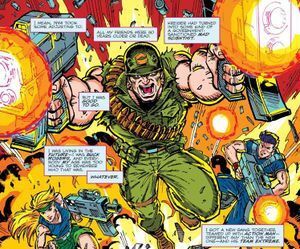 The IDW version of Savage's 90s 'tude was likely more inspired by his appearance in the subsequent G.I. Joe Extreme series. The original Sgt. Savage commanded the newly-assembled Eagles in the 1990s, but this was changed to the 1940s for IDW continuity. Savage's middle name has not been rendered consistently: "Stevens" was used in G.I. Joe vol. 3 #7, Joe Colton's bio in Revolution #2 uses "Stephan", Revolutionaries #6 uses "Stephen", finally and Revolutionaries #3, #7, and #8 use "Steven". The latter is the original way Savage's middle name was rendered.